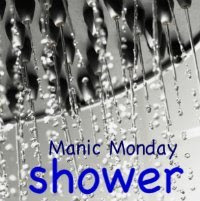 Mo's word for this Manic Monday is SHOWER. I chose to show you "Shower of Flowers" because when I was searching for something to post the peaceful expression on this woman's face caught my attention. 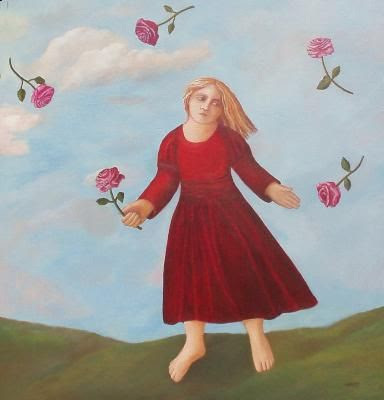 Nicola Slattery is a contemporary artist working in different media to produce mainly figurative art work. Her favoured media is acrylic on board however she is also an accomplished printmaker especially fond of the drypoint technique. Her art can be found for sale in leading contemporary art galleries and art fairs across the UK and in Ireland. Go over to Mo's Manic Monday to see and enjoy other participants. Lovely choice of images, Mary. 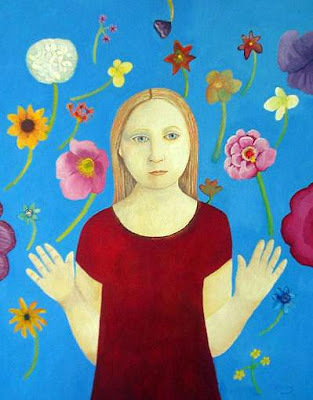 Her work makes me think of an update on and an improvement of folk art. There are life and quiet and beauty here all at once. The first thing I thought of her expression was melancholy.